This is a medium from the Dark Ages - few of today's painters have had the opportunity to work with it. Sauce was a nearly-extinct medium that offered a full ten value tonal range. In the tumult of the last century, Sauce was all but lost to the world's artists. It survived only in Russia. It is a stick much like a soft pastel, but when applied to paper, it gives a sensation of warm silk, slightly greasy but not oily. Breaking the Sauce down into its powder form can add to the versatility of its use. 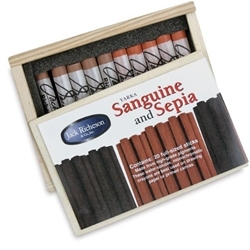 Each wooden boxed set contains 10 sticks which measure 7/16"x1-1/2".